InfoSAWIT, JAKARTA - Palm oil plantation development has many challenges. Chairman of Indonesian Palm Oil Board (IPOB), Derom Bangun said that the palm oil challenges are massive ahead. That is why it needs to take other stakeholders, including the graduates who have capability (to face the challenges). He said, the graduates could think where palm oil should be developed. The graduates should not only talk but also give and provide solutions. 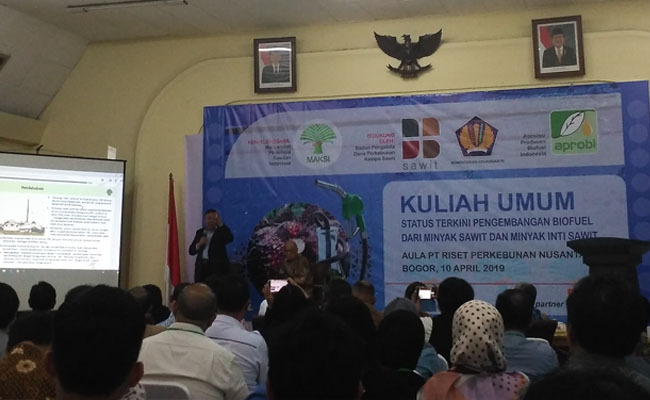 “We should trigger the challenges,” he said in the Public Lecture that Masyarakat Perkelapasawitan Indonesia did and attended by InfoSAWIT, Wednesday (10/4/2019) in Bogor. Meanwhile the former Minister of Agriculture, Prof. Bungaran Saragih said, admitted or not, the power of Indonesia is actually in the agricultural structure. So it is the time to develop it. “It was not a prior but now I am happy, there are many sides thinking to develop this sector,” he said.